Located 50 miles (80 km) northeast of Las Vegas (Overton), at an elevation of 2,000–2,600 feet. Abuts the Lake Mead National Recreation Area at the Virgin River confluence, measuring a 4 by 6-mile basin (6.4 - 9.6 km). 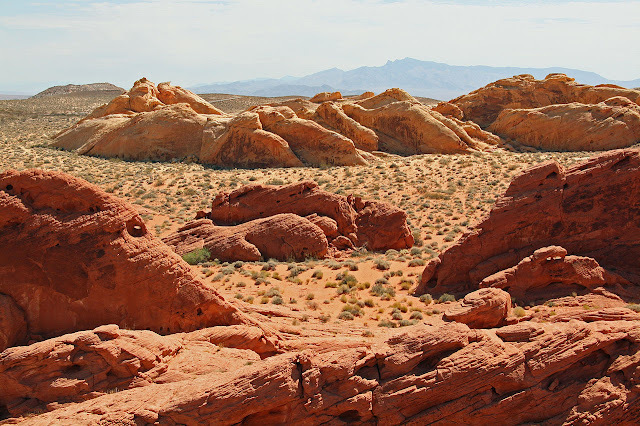 Sometimes mistaken for Utah’s Valley of the Gods, Nevada’s Valley of Fire State Park is quite a ways from the Colorado Plateau, and with an entirely different geologic setting. Displays red sandstones exposed beneath the Sevier fold-thrust belt, where older rocks of Cambrian age (about 500 million years old) were pushed sideways on a so-called thrust fault over younger rocks (Jurassic, about 160 million years old) of the Aztec Sandstone. The sandstone was laid down in a colossal, long-lived sandy desert like today's Sahara or Arabia. The red color is from the presence of iron oxides in the sand. Focus: geology and human history. 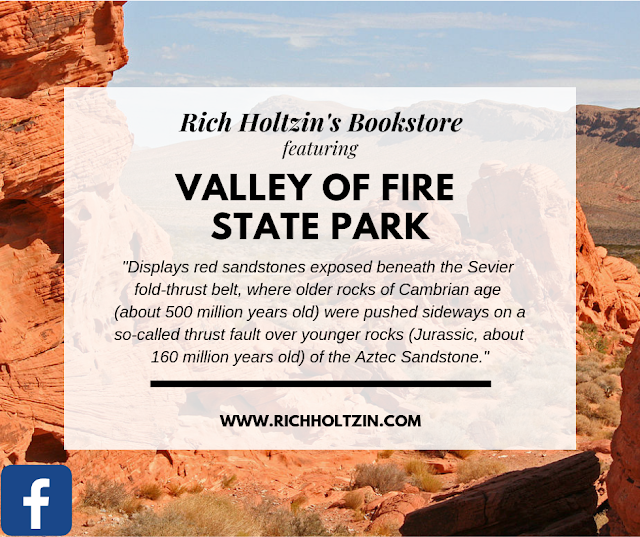 The Valley of Fire derives its name from red sandstone formations, formed from great shifting sand dunes during the Mesozoic Era’s age of dinosaurs (252.2 - 72.1 myr). Complex uplifting and faulting of the region, followed by extensive erosion, have created the present landscape. Other important rock formations include limestones, shales, and conglomerates. 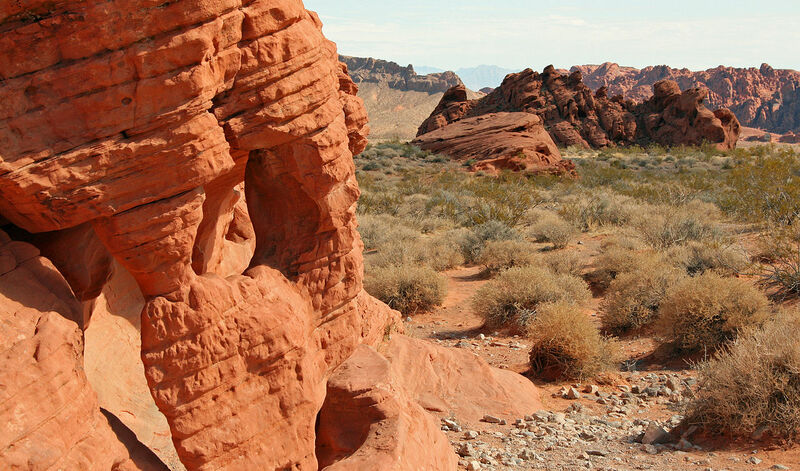 Prehistoric inhabitants of the Valley of Fire included the Basket Maker people and later the Ancestral Puebloans from the nearby fertile Moapa Valley. The span of approximate occupation has been dated from 300 BCE to 1150 CE. Their visits probably involved hunting, food gathering, and religious ceremonies, although the scarcity of water would have limited the length of their stay. Fine examples of rock art left by these prehistoric dwellers can be found at several sites within the park. 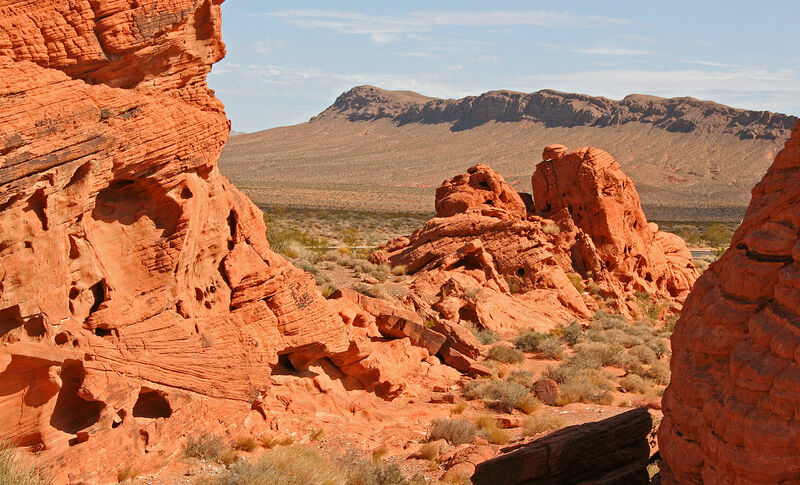 The Valley of Fire is the oldest state park in Nevada and was designated a National Natural Landmark in 1968. The valley covers an area of almost 42,000 acres (16,996 hectares) and was dedicated in 1935. 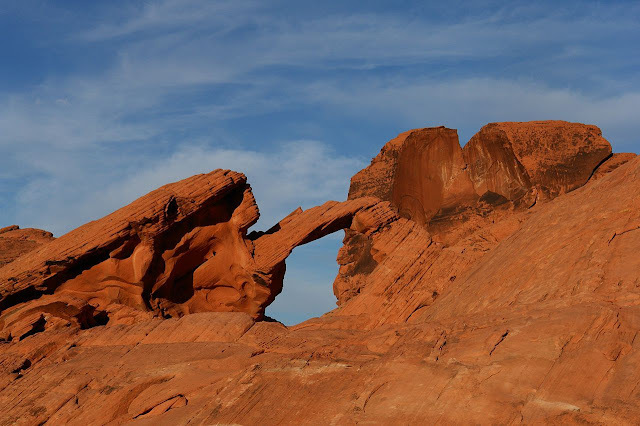 It derives its name from red sandstone formations, formed from shifting now petrified sand dunes during the Mesozoic Era. These features, which are the centerpiece of the valley's attractions, often appear to be on fire when reflecting the sun's rays. Complex uplifting and faulting of the region, followed by extensive erosion, have created the present landscape. The rough floor and jagged walls of the park contain brilliant formations of eroded sandstone and sand dunes more than 150 million years old. 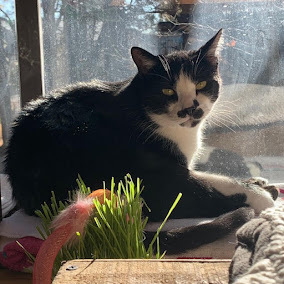 Other important rock formations include limestones, shales, and conglomerates. No wonder this setting was dubbed Nevada's first state park. Given the alien landscape of the valley, its erosional landscape denotes where the flow of the rock reflects the flow of time. Wrinkled, etched and scoured by time and the elements, primordial rock walls stand exposed to the inexorable eroding forces of water and the wind. Melting snow and rainwater percolate downward through the sandstone thereby dissolving the cementing carbonate and iron from between the grains of sand, weakening the structure. In time, the rock disintegrates. As the water emerges along exposed rock faces, the liquid evaporated into the dry desert air, leaving behind a residue of iron to veneer the rock with dark brown and black patina (aka “desert varnish”). Some of the rock formations are tinctured with a lovely pink and white pinstriping effect. 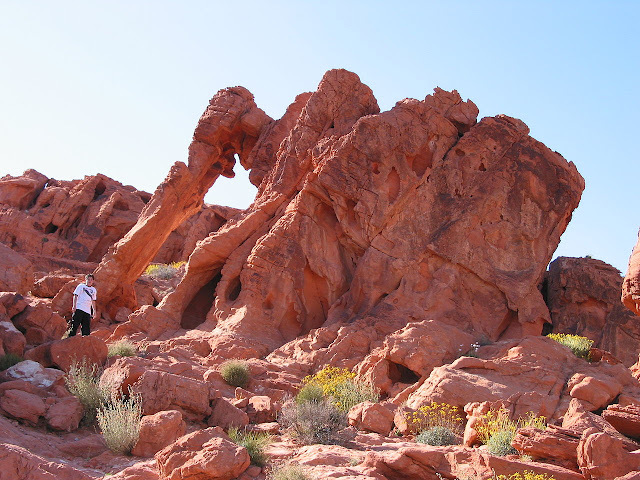 Valley of Fire State Park is six miles from Lake Mead and 55 miles northeast of Las Vegas via Interstate 15 and on exit 75. The park entry from Interstate 15 passes through the Moapa Indian Reservation. 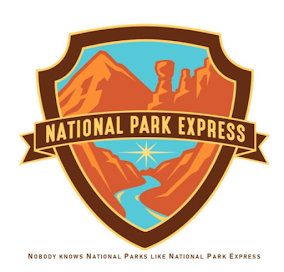 The Visitor Center in the park should be visited by anyone planning any off-road activities. The site is marked as Nevada Historical Marker #150.